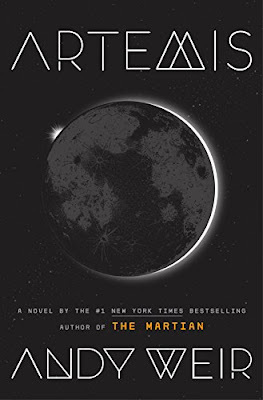 Andy Weir is back with a new space-inspired novel: Artemis. No one can forget, his previous best-selling novel, The Martian, which was adapted into the blockbuster motion picture that featured Matt Damon stranded on The Red Planet. I thought The Martian was great. The book was slow and steady, and in doing so was able to accurately capture the feeling of being isolated in space. Growing potatoes, figuring out a way to reuse the water and supplies...it was methodological plan put into place with one man with no resources. Yes, it was a plausible narrative. Artemis, is different. The characters are different. It's more of a fast-action narrative featuring a smart, young millennial called Jazz Bashara who lives on the first city on the moon. She's a bit of a rebel, loves to have a good time and also estranged from her devout Muslim father. Working as a porter, to support herself, she's constantly struggling to just get by. Jazz doesn't always follow the rules, but always keeps her word. One thing I picked up from Dad: Always keep your bargains. He worked within the law and I didn't, but the principle was the same. People will trust a reliable criminal more readily than a shady businessman. Jazz desperately wants to become rich and her ambition leads her to a shady venture with a businessman named Trond, who convinces her that his job is exploiting underutilized resources...such as Jazz. Eager to move out of her coffin-sized apartment and eat something better than flavoured algae, Jazz embraces the opportunity to convert from small-time smuggler to full-on criminal mastermind. I enjoyed Artemis. For fans of The Martian who were expecting a revival of Mark Watney's character and situation, this is not it. And, why should it be? Do we really want to read another novel exactly like The Martian? 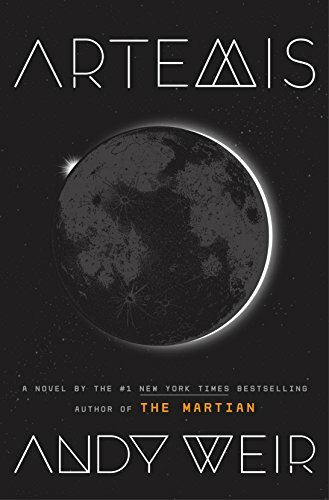 In that respect, Andy Weir has pushed the boundaries and created characters that are plausible in another world, time and setting. The plot of Artemis is more complex. There are components to the story that require connecting to move the story forward. But it's orchestrated perfectly and compels a new set of readers into the world of sci-fi fascination.